enjoying a meal you have cooked. 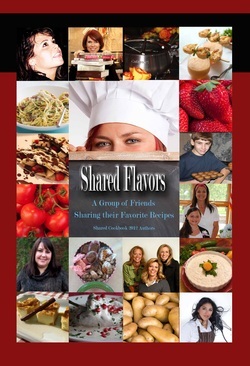 This book has a collection of favorite recipes put together by a group of friends, proven to have made their own friends and families happy. This unique collection of recipes from people with diverse ethnic backgrounds has tips, directions and great photos. The book includes ideas that will help you cook for a big party, prepare an authentic Jewish holiday dinner, throw a Mexican fiesta, succeed on Thanksgiving, enjoy a delicious fondue, or just quickly put together an easy-to-cook meal. Our cooks also help you by recommending websites from which you can buy hard-to-findingredients for a truly authentic Mexican, Greek or German meal. Mexican Fiesta – Rosy Hugener. The Greek Kitchen - Mia Psaltis Connolly, Christina Angelos, Eva Skordilis, Julie Kokonis Phipps, Mary Panagakis, Georgene Karkazis Shanley, Constance Gekas Hugdahl, Alexandra Vainikos Carson and Dimitra Alexakos. Recipes from Xnipec Restaurant - MariaLuisa Romo. Vicki's Holiday Traditions – Vicki Peterson.